Just across the Hudson River from lower Manhattan is Paulus Hook, a Jersey City neighborhood that, on August 19, 1779, was the scene of a notable Revolutionary War battle, the Battle of Paulus Hook. Although today dominated by 19th-century brownstones and new luxury highrises, this area was originally occupied by the Lenape Indians and settled by the Dutch in the 17th century. At high tide the "hook" became an island, making it an ideal location for a fort. Such a structure was built there in 1776 by the American Revolutionaries as part of a series of outposts along the Hudson. 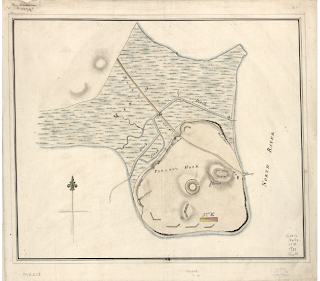 However, when the British took Manhattan from the Americans in November 1776, the fort in Paulus Hook was abandoned and soon became occupied by the British. But on the afternoon of August 18, 1779, three years into the war, a young go-getter by the name of Henry Lee III aka "Light Horse Harry" led a raid on the fort that exemplified the audacity of the Revolutionary cause. Lee, had graduated from Princeton in 1773 and joined the Virginia Dragoons. Elevated to the rank of major he commanded "Lee's Legion" a combined cavalry and light infantry force known for swift movement. Lee's battlefield actions had earned the admiration of General Washington and the forces of Lee and Washington often worked side by side in the fight against the British. Lee had proposed to Washington a raid on the British fort at Paulus Hook and, having received the general's approval, he and his men marched from New bridge (modern River Edge, New Jersey) 14 miles away to reach Paulus Hook at low tide on August 19, 1779. At 3:30 in the morning, the forded a salt marsh and canal to reach the fort where they took nearly 160 prisoners and killed 50 British soldiers with a loss of only 2 American lives, 7 captured American soldiers and 3 revolutionaries becoming wounded. 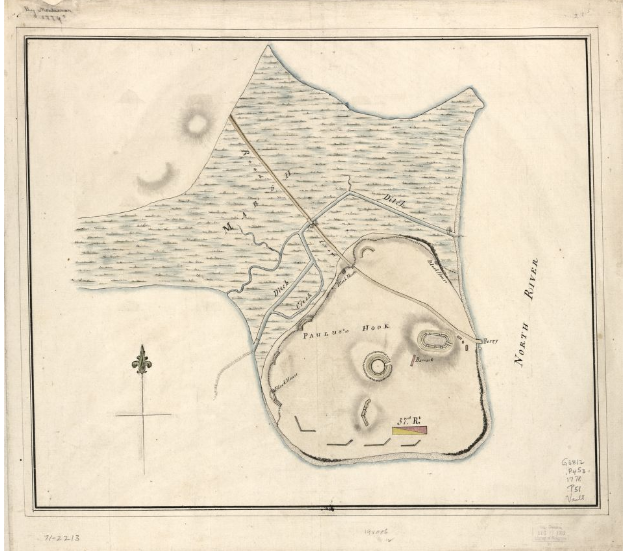 Courtesy of Library of Congress Prints & Photographs Division, Washington, D.C.
A plan to burn the fort's barracks was abandoned when ailing civilians were found to be quartered inside. With daylight breaking Lee's forces made their retreat with the benefit of additional forces stationed on the Bergen Highlands (modern Journal Square) to cover them. Lee had arranged for ferries to take them to relative safety across the Hackensack River where they could march back to New Bridge. However, the boats had returned to Newark, compelling Lee to march back to River Edge in closer proximity to British reinforcements from the Manhattan garrison. Not only was the element of surprise lost but Lee's forces were disadvantaged by the large group of prisoners they had captured as well as ammunition which had gotten wet during the raid. The British did pursue them but American reinforcements helped Lee fight them off and they safely arrived back at New Bridge. 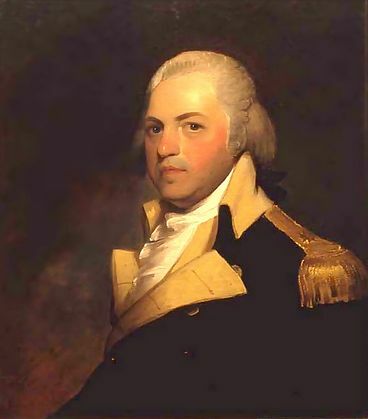 Lee was commended by Washington for his bravery and prudence and was recognized by Congress the following month for his leadership in the Battle of Paulus Hook. Lee went on to become the governor of Virginia, a lifelong friend of Washington and the father of Robert E. Lee, commander of the Confederate forces during the American Civil War. In addition to the obelisk commemorating the battle (placed in the middle of the intersection in 1903, removed in the 1930s after it was hit by a truck and re-erected in its current location in the late 1970s after being forgotten for 40 years), the battle is memorialized by the Light Horse Tavern located at the corner of Morris and Washington Streets. Superb atmosphere and food at the Light Horse Tavern. It is historically significant for the role it played in America's fight for freedom in 1779. A view of the Statue of Liberty from Paulus Hook in Jersey City, New Jersey. What a fascinating piece of JC history! Thank you for presenting it and for the beautiful photos. I like what you guys are up too. Such clever work and exposure! Keep up the terrific works guys I've incorporated you guys to my blogroll.